Bye, Bye Larry. Hello Randy. Can you believe it? 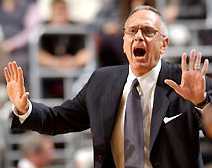 Larry Brown is gone as Sixers coach after 6 years. What will we do? No doubt about it, LB is a good coach. But enough crying already. That's what happened between Ed Snider and LB. Larry , with his perpetual need for love and reassurance from the owner, went to well "crying well" once too often. Oh, need me, tell me you can't live without me, how I'm the best coach around. Pass the Maalox. It was enough to make you nauseous. Imagine Ed having to deal with this tiresome act every year after Croce left. Ed just so "No Mas". And when Ed did that, Larry wanted a divorce and Ed sent him packing . Thank goodness Ed didn't tell Larry he needed him for the Sixers this time. If he had , we would still be enduring LB's crying after wins and losses and telling us why Iverson doesn't play right and how DC knows the Game. Randy Ayers will do just fine. He is already saying some things that are different than the Hall of Fame coach that he is replacing. More 3 point shooting, push the ball up court, up tempo game play. All while keeping the defensive mind set. LB never accepted the 3 point shot, so we suffered from not shooting them or defending them. Ayers was the student to the Master for 6 years. Many times the student surpasses the teacher. Plato taught Socrates and Socrates taught Aristotle. Larry taught Mo and Randy. Let's just hope Larry kept his whining secrets to himself. I just couldn't take anymore crocodile tears after every game.